Rotoman’s Agony: What Am I Supposed to Do With Perfection? 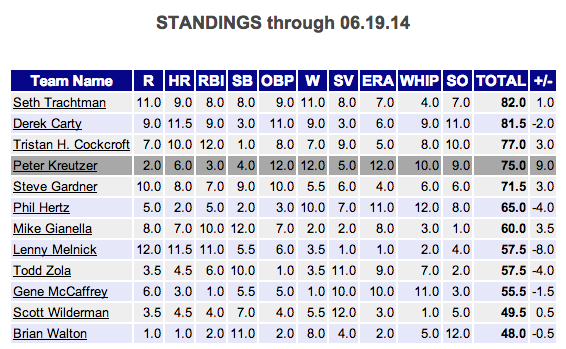 In the last two weeks my Tout Wars NL team has ascended, from 11th place on June 1 to fourth place today (yesterday I was in third). That’s a gain of 21 points in 19 days, but the gains were uneven. While I added four points in hitting, I gained 17 points in pitching. 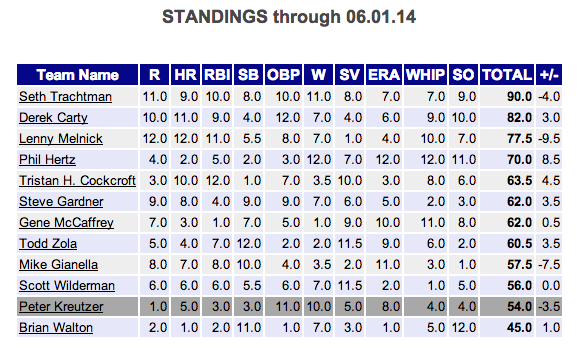 The reasons are obvious: My Bumgarner and Bums staff really started to click this month, and so I climbed four places in ERA, jumped six spots in WHIP and climbed five places in Strikeouts. Collectively, that’s 16 wins, four saves, a 2.79 ERA, 1.099 WHIP, with 142 K and 40 BB in 164.7 IP. The red numbers are those of June 1 to June 19, but the fact of the matter is that the year to date numbers aren’t too bad either. Which is great fortune, a thrilling example of my preseason strategy working to perfection, and a problem. 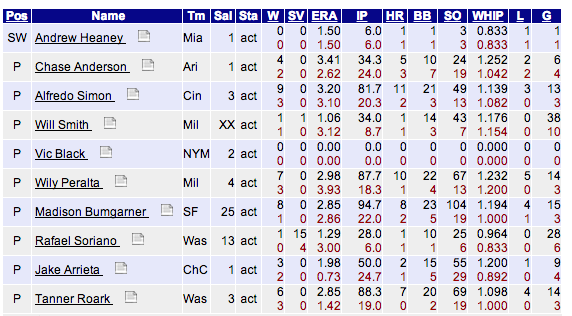 How much should I believe in these <$5 pitchers for the rest of the year? My first thought was to look at inseason projection systems, but that was depressing. The fact is that projection systems are not able to pick up real jumps in skills, or will miss (at first, anyway) a spike in playing time. I’m not saying they’re wrong because they don’t have much good to say about Chase Anderson’s chances, or say Andrew Heaney is slated for 20 to 30 IP at this point. That’s what they thought before these guys started playing. But I’m certainly not making any decisions based on what they’re saying there. The projections are pretty positive about Alfredo Simon and Tanner Roark, control specialists who had some success last year, but they don’t see any progress in Wily Peralta or Jake Arrieta, live arms who’ve had command problems in the past, but seem to have them better under control this year. I like all four of those pitchers just fine, but I have to admit that I don’t see any of them improving their ERA’s going forward. Does that mean in the coming weeks I’m going to give back this past few week’s gains? And if so, how do I stop that? I can’t just dump these guys? And they don’t have much trade value at all, for the same reason. A visit to last year’s month-by-month stats gave me a different perspective. 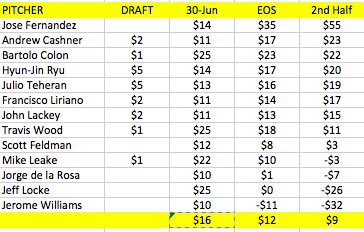 I sorted out the pitchers who were earning $10 or more at the end of June last year who cost $5 or less on auction day. That, I figured, should be a rough proxy for my overachieving bunch. Thirteen starters fit the bill. The bad news was that four of them posted negative earnings in the second half of the season, two of those suffered (imposed?) devastating losses. The good news is that eight of the group posted $10 or more earnings in the second half, essentially maintaining or improving on their first half. Jose Fernandez was ridiculous, and I don’t have one of his kind on my team (unless it turns out to be Heaney), but the others are a pretty good mix of scruffs who are working it out as they went along. I probably could have organized these better. the 30-Jun column is first half earnings. These are scaled to the full season budget, so they are directly comparable to the second half and end of season earnings. I recently read an interview with Dan Szymborski about his ZIPS projections in which he claimed that inseason gains on a player’s part are “stickier” than they are from season to season. That is, a player who gets off to a surprising start is more likely to have a surprising second half than he is to sustain those gains into the next season. I have no idea if this is generally true and how widespread it is to the extent it is true, but I think these results bear out, at least, that if a more or less complete surprise shows something, it isn’t a total fluke. So I’m going to stick with my guys, and work hard to find even better guys. Nobody claimed that putting together a perfect pitching staff is easy. What I won’t be doing, at least not in the near run, is trading a starting pitcher. I need more hitting, but other owners trust my Bums less than I do. And while I could trade Bumgarner, I think I’m going to wait on that. He represents the wind beneath my staff’s sails. His otherworldly talents offset any number of deficits (I’m looking at you Edwin Jackson), and I don’t yet believe quite enough that my team can rise without him. But we’ll see what happens over the next few weeks. One Response to Rotoman’s Agony: What Am I Supposed to Do With Perfection?